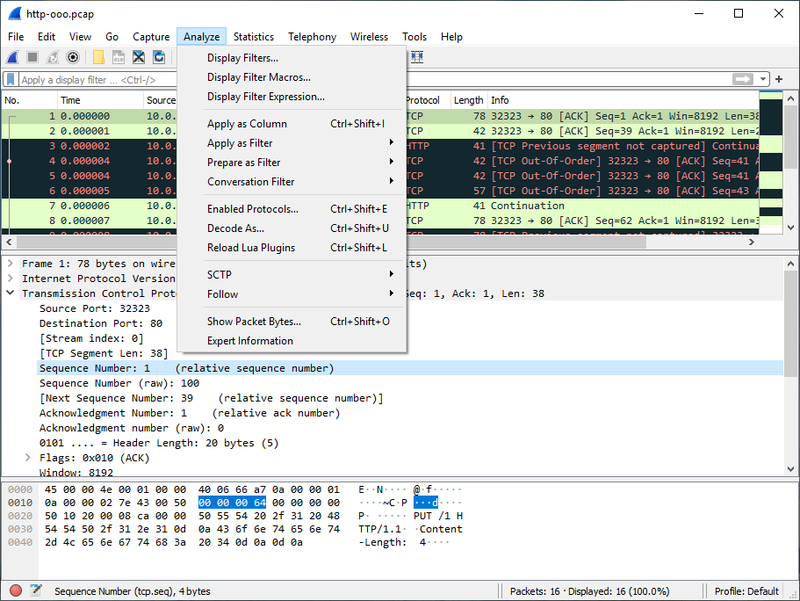 The Wireshark Analyze menu contains the fields shown in Table 3.8, “Analyze menu items”. This menu item adds the selected protocol item in the packet details pane as a column to the packet list. These menu items will change the current display filter and apply the changed filter immediately. Depending on the chosen menu item, the current display filter string will be replaced or appended to by the selected protocol field in the packet details pane. These menu items will change the current display filter but won’t apply the changed filter. Depending on the chosen menu item, the current display filter string will be replaced or appended to by the selected protocol field in the packet details pane. Same functionality as “Follow TCP Stream” but for UDP “streams”. Same functionality as “Follow TCP Stream” but for TLS or SSL streams. See the wiki page on SSL for instructions on providing TLS keys. Same functionality as “Follow TCP Stream” but for HTTP streams. In this menu you will find conversation filter for various protocols.